Play Fruit Tumbling online for free now! What are the ingredients for a great slot? That's right - it has to be fun and offer great winning chances! 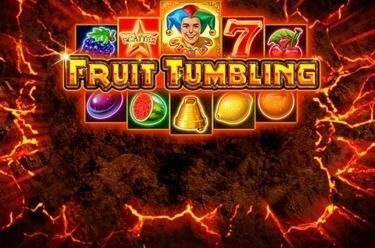 Fruit Tumbling is a mixture of both to provide succulent gaming fun. Check out this fascinating game for yourself on five reels and 10 win lines. And what's more: with a little luck, the cheeky Jolly might grant you pleasant surprises! 5 identical symbols side by side on one of the win lines running from left to right will shower you with Twists! You win from as little as 3 identical symbols. These winnings then burst, the symbols above move up and new symbols occupy the empty spaces until no more winning combinations occur. The Jolly acts as Wild symbol. It can substitute for any other symbol except for Scatter symbols (Star) to complete a winning combination. 3, 4 or 5 Scatter symbols (Star) in any position on the reels trigger 15 free games with a double multiplier. The more consecutive winning combos are created by bursting winning symbols the higher the multiplier will rise – up to x16 is possible! The multiplier returns to x2 when no more winnings are earned in this free game and another spin starts. Moreover: Further free games can be won during an active feature when you collect 3 or more Scatter symbols. Sit back, relax! This slot is the perfect pastime for a couple of laid-back hours. 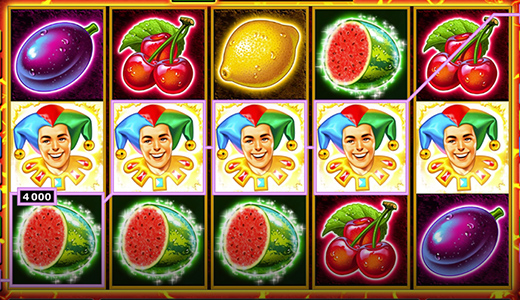 Fruit Tumbling provides plenty of fun and never ceases to amaze, which is why this slot is a must for gaming aficionados!